Social Media Clarity – 15 minutes of concentrated analysis and advice about social media in platform and product design. News: Rumor – Facebook is about to limit 3rd party app access to user data! Topic: What is a social network, why should a product designer care, and where do you get one? How could I know that singing “Man of Constant Sorrow” in public could be considered a terrorist weapon? 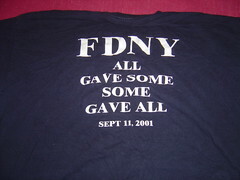 One early spring evening in 2002 I went for a walk in my neighborhood wearing my FDNY September 11th Memorial T-Shirt (shown above), telling my family that I would return just after sundown (about 30 minutes). My family didn’t believe me at first – until I showed them the reddened cuff marks on my wrists and the business card of PAPD Sergeant, Sandra Brown. One mild spring evening in 2002, I felt like singing. I wanted to teach myself some bluegrass and spirituals that I’d discovered recently (mostly as the result of recently seeing O Brother Where Art Thou?) and I felt like being real loud. So, rather than disturb by family, I decided to go for a walk and practice elsewhere. Given the weather, I’d only need a tshirt and jeans to keep me warm until well past sundown. I started singing right away when I got outside, but then noticed some of my neighbors, so I thought that it’d be better if I could find a place to belt out my baritone/bass tones where no one would care if I were in tune. I was practicing, after all. I’d made good time hiking to the pedestrian overpass, humming “Ahhhh am a maaaaan, of con-stant sah-roooow…” along the way. By the time I reached the apex of the passage, the sun was very low in the west dropping just below the hills. The gold-purple sky was an inspirational sight. The constant breeze from the cars whizzing by below was quite effective in carrying my voice away, so I cranked up the volume. I was having a great time and expanded my material to include my favorite Webber show tunes. Other than a pair of guys walking by, my only audience was the late evening commuters most of who had just turned on their headlights. It was a blast. For 15 minutes I was able to belt out anything I wanted, as loud as I could. When I was starting to feel the effects of singing continuously that loudly the sun had completely set, so I decided to head home. I was running a little later than I’d expected, so I increased my gait a just bit. I wasted no time at all, I put my hands in the air and turned my back to them. I kneeled, quickly enough that it hurt. “I think there’s been some mistake, whatever you do, please don’t let go of that dog” is all I could think to say at the moment. I had no idea what the heck was going on, but I didn’t want to give them any reason to make a horrible mistake. An officer came up and handcuffed my wrists behind my back, aggressively patted me down, and helped me to my feet. My wallet was retrieved the commander-woman. Once I could face the squad again, I clearly recognized her as Sandra Brown, an officer who had done many hours as a bicycle-beat cop in the downtown Palo Alto area, where my family had spent nearly every Friday evening for nearly 14 years. I was hoping that this meant she might recognize me as well, helping to diffuse whatever this horrible mess was all about. Fifteen to twenty minutes passed. Officer Brown checked my ID and confirmed that I’m local. She noticed my shirt for the first time. The cuffs were starting to hurt. I’d been told to be quiet. The sturdy, but small blond woman with the assault rifle was keeping it at-the-ready, but it isn’t pointing at me. The dog had stopped barking, but was at some kind of station-keeping pose. Lots more radio traffic. I finally piece together that at least two officers were on the other side of the ramp are looking for something, something that they think I might have hidden there, something critical to this situation. Finally, the invisible officers at the other end of the radio apparently gave up the search. My heart stopped racing. My temperature started to drop. You see, I finally stopped thinking that I’m likely to end up wounded or dead due to someone panicking. Once the search is over, it became clear that maybe the situation was not what they had expected/feared. Officer Brown started to explain: “We got a phone call from someone on a cel-phone driving on 101 reporting a sniper, wearing a trench coat, was shooting at cars with a high-powered rifle or machine gun.” Apparently this triggered the Palo Alto equivalent of the swat team. I couldn’t resist: “An overweight middle-aged man, singing the lead from The Phantom of the Opera (probably waving his arms about, crooning to Christine about being ‘inside her mind’), while wearing jeans and a tshirt that reads All Gave Some, Some Gave All on the back, somehow looks like a Columbine kid terrorizing the freeway with an automatic weapon? What irony: Wear a public-safety-supporting tshirt, get suspected of being a sniper.”. This observation did get a bit of a giggle out of the one with the real Tommy gun, finally hanging peacefully at her side. Other than practicing the first of many tellings of this story on the way home, I have never forgotten that the fear generated by the terrorist attacks on 9/11 had changed our world forever. I don’t think that driver would have ever made such are report if this had all occurred one year earlier. Fortunately for me, the police still are trained to get things right before they themselves start shooting reported terrorists.